Hello readers! Sabrina here with one of my favorite posts to date. When I first heard of Landed.com I knew I wanted to be a part of their movement. Landed is a Down Payment Assistance / Equity Share Program aimed to help local teachers obtain the much needed 20% down payment for their home purchase. Trust me – around here that kind of help makes a difference. I immediately reached out to them and asked if I could help teachers in need and the rest is history. We had the pleasure of helping Lars and several families navigate the competitive waters of Bay Area Real Estate and make a piece of California their own. I cannot tell you how much joy it brings me to not only help these teachers, but to earn their trust and respect as they jumped into market feet first – dreaming of owning a home in thier community. The Caton Team loved helping them and ready to help another teacher. If you are a teacher or you know a local teacher – please send them our way and we’d be happy to connect them. For everything our local teachers give – it’s so good to be able to give back! It’s true that loans with down payments of 20 percent or more cost borrowers less over time than low down payment loans. Low down payments leave larger principals to pay off, and those principals create more interest over time. Low down payment loans also require mortgage insurance. However, a low down payment itself can actually boost affordability by getting you off the sidelines and into a home of your own sooner. At current interest rates and based a median family income, you’d need about 22 percent of your income for monthly payment with a 20-percent-down mortgage and about 24 percent with a 3.5 percent down payment. And, should rates rise to 4.75 percent by the end of this year, a buyer putting 20 percent down would pay about 25 percent of his monthly income and a buyer using a low-down payment loan at 3.5 percent down payment would pay about 28 percent of the buyer’s monthly income. While 20 percent isn’t necessary and isn’t even the average (7.6 percent), it will help reduce the monthly payment simply because your total mortgage loan is less than with a lower down payment. But, it’s important to evaluate the cost-benefit of a lower down payment. Forgoing a low down payment today to save for a 20 percent down payment in the future changes the equation for first-time buyers. 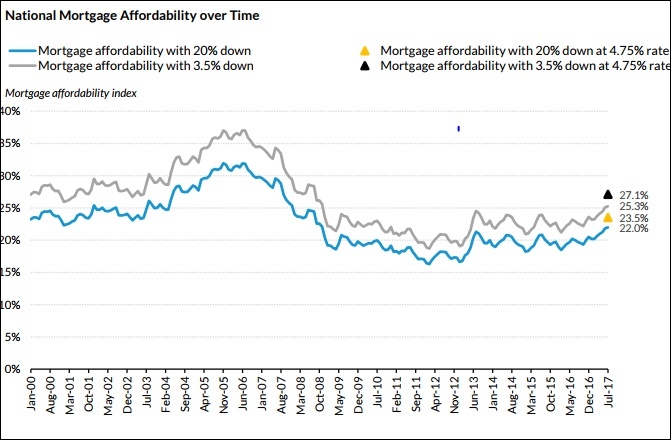 With home prices and rates on the rise in 2018, affordability will likely worsen in the months ahead. In fact, a recent survey by Apartment List found that it takes many millennials a decade or more to save enough to make a 20 percent down payment. By that time, the costs of waiting so long will outweigh the advantages of a larger down payment. Since 2012, it has been cheaper to buy than rent in most markets and rents today are consuming an even larger share of monthly disposable income. By the end of this year, rates could rise as high as 4.75 percent, and prices are forecasted to continue to rise in 2018. Rising rates and prices will increase the cost of a 20 percent down payment for those who delay. Don’t aim for a 20 percent down at all costs. Yes, it can help drive down your monthly payment, but you also want to ensure you have a strong financial cushion when you become a homeowner. And, if you wait too long, you may end up paying more with a higher interest rate and home prices. Search for homebuyer programs available in your market and for your personal situation. You may find a program that can help with the down payment and/or closing costs. Find a knowledgeable agent or lender who is eager to teach — you want someone who can help you evaluate all your options. For more data and information on down payment trends from a variety of sources, subscribe to our monthly Down Payment Report.